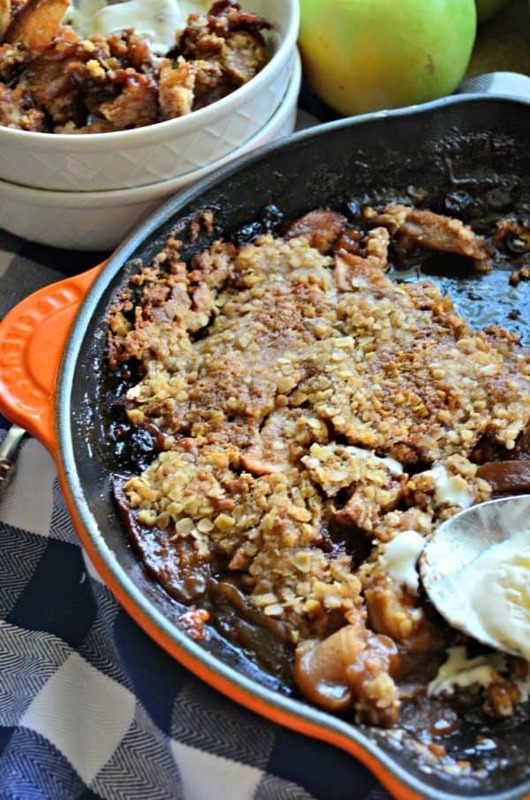 Skillet apple crisp is so quick and simple you can have it any night of the week. Dessert that’s cozy and warm, and just SO dang good. I’m back at it again with another apple recipe. Apple season is one of my favorite times of the year. Nothing beats a fresh crunchy juicy apple! And then mix it with sugar and all sorts of other stuff and it elevates the fruit that much more. Each year, I try to embrace the season to the best of my ability. This pregnancy I’ve done a very good job at doing just that. I’m pretty much obsessed with all things apple this pregnancy. My husband will find me baking some sort of dessert in the kitchen just about every other night to satisfy my sweet tooth. 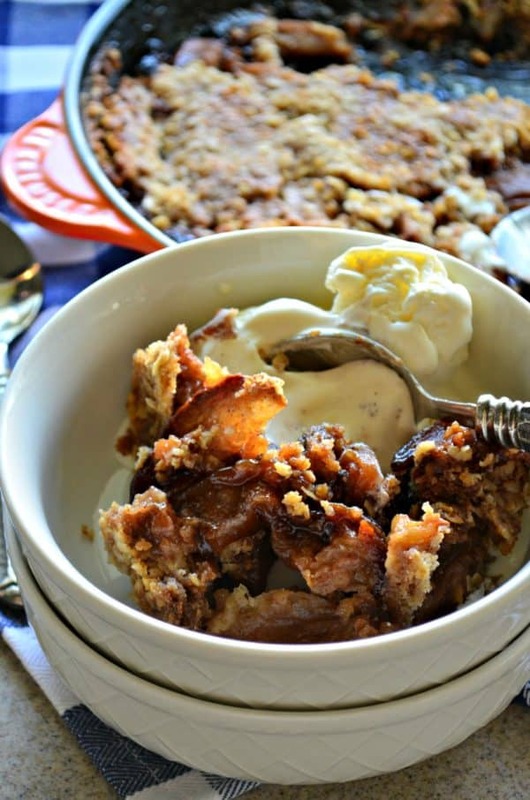 One thing I can’t deny is my love for a good skillet apple crisp. I’ve been making them for years and finally sharing my recipe for it today. Back in October, we spent a few days in Western North Carolina where we stayed with my cousin and toured around the outskirts of her town. Our original family vacation was suppose to be a week in Hatteras but that got derailed thanks to Hurricane Matthew. So we made lemons out of lemonade or should I say apples out of apple crisp and got to experience some fun new adventures during our last months as a family of 3. One of the days we drove 2 hours into northern North Carolina to go apple picking. We picked a bushels worth of apples for just $12 and we rode through part of the Blue Ridge Mountains snacking on apples. When we got home from our trip, I started baking my little heart out. 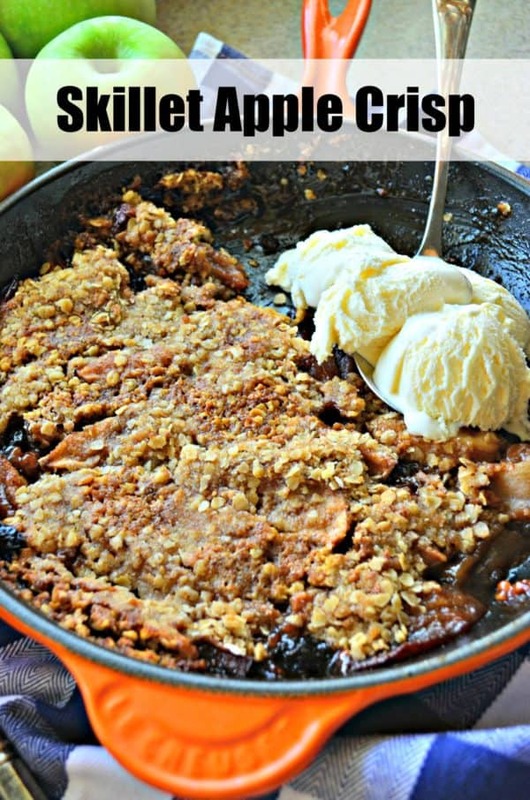 One of the first things I made was my skillet apple crisp. I always have all the ingredients on hand to make this crisp and I like to add raisins in my crisp. I normally use golden raisins but traditional brown raisins will do as well. If you don’t like raisins—just omit them. It’s a taste preference and not a life or death decision here. I also like to precook my apples in the skillet for a few minutes to start the cooking process. While I cook the apples I make the crisp topping. Because you pre-cook the apples on the stove top first this will cut your cooking time down tremendously in the oven. 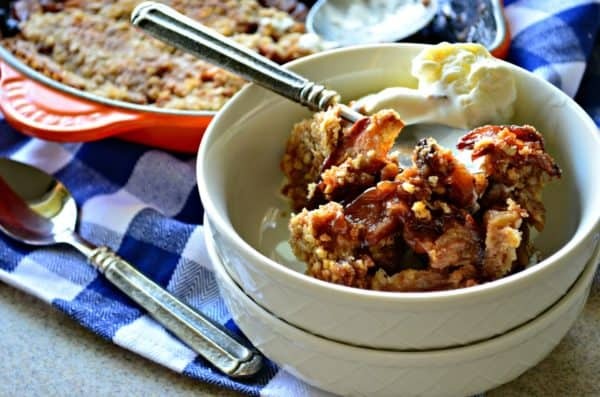 I like to cook my crisp for around 30 minutes until the top is golden brown and then I serve the skillet apple crisp warm with a few scoops of vanilla ice cream.